Breaking News! : The Women's Equality Exhibit! Women For Action recognizes the achievements and advancements made by women. 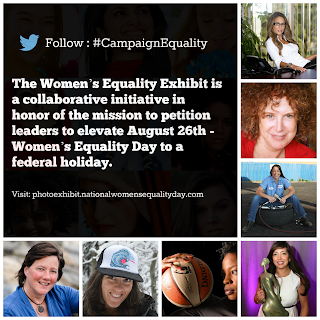 As a further commitment to this effort, we propose an educational exposition on women, the Women’s Equality Exhibit, a collaborative initiative in honor of our mission to petition our leaders to elevate August 26th, Women’s Equality Day to a federal holiday. Labels: campaign, events, fundraising, petition, Take Action!